Every time you see one what people from decades ago thought the future would look like, you're reminded that what happened in reality wasn't nearly as impressive as what people envisioned. 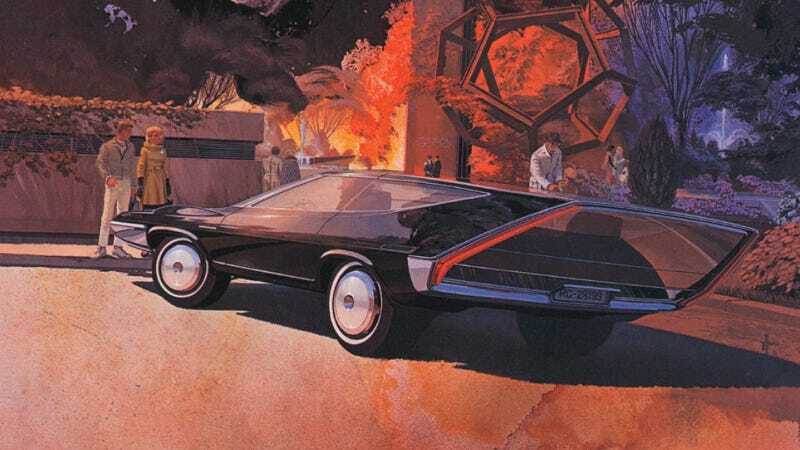 Syd Mead's beautiful images of the future revealed that while we'd have to put up with things such as lion statues and orange jumpsuits as fashion statements, at least we'd get fantastically pointy shooting brakes to go with them. Plus, all of these cars look like they're outrageous versions of classic '70s land yachts and wedge-mobiles. Could there be a more comfortable, characterful way to travel in the future? A car like a pointy Cadillac shooting brake would be perfect for the world we're living in today. Mead probably wouldn't believe that in 2013 people would be driving such awful-looking things as a Nissan Versa. Yes, apparently the people of the future aren't that into handling either, EVERY single one of these designs seems like it would have sooooo much body roll. Makes us long for simpler times with better, smoother roads.